Bend, OR – Mt. 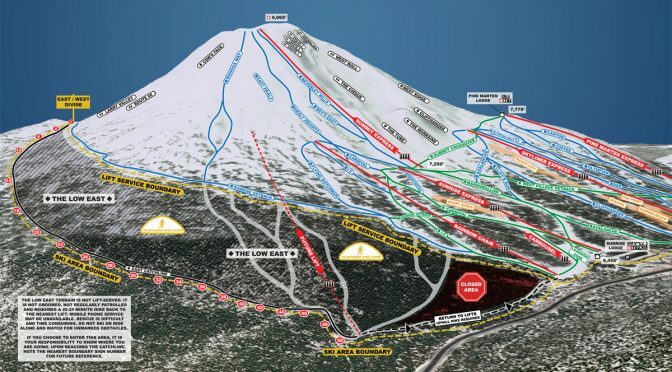 Bachelor skiers are welcoming a new season with a long-awaited chairlift, expanding terrain on the mountain’s southeastern side. Bachelor’s new Cloudchaser high-speed detachable quad lift, manufactured by Doppelmayr, will expand the resort’s terrain by 635 acres to 4,318 acres total, making it the fifth largest ski area in the U.S. Its lower elevation is less prone to the weather holds common at Mt. Bachelor, with a top terminal located right at tree line. The terrain serviced by the new $6 million lift is a playful mix of rolls, steeps and dips through the forest for maximum entertainment. For the first time, skiers and riders can descend Mt. Bachelor’s southeast face beyond the Sunrise Getback through the Low East sector all the way to the East Catchline, without having to hike uphill to return to a lift. Cloudchaser represents the first new chairlift installed at Mt. Bachelor since the replacement of Pine Marten Express in 2006, and the first completely new chairlift providing access to previously unserved terrain on the mountain since the opening of Northwest Express in 1996. Bachelor skiers have been awaiting the new lift since it was first approved in 2013. It has a total length of 6,576 feet, with a vertical rise of 1,448 feet. Towers for the new Cloudchaser lift were dropped into place by helicopter last week, and construction is expected to be complete by mid-December. In conjunction with the new lift, Bachelor is shortening the adjacent Rainbow chairlift to just below the steeper headwall at the top of its current configuration, making Rainbow more accessible to intermediates. As Cloudchaser will serve all of the terrain previously available from Rainbow, the latter is expected to spin much less frequently going forward, only when demand dictates.